The heart is a muscular pump that fills with blood when the muscle relaxes (diastole) and forces blood out during contraction (systole). The heart sounds are normally a ‘lub dub’ sound when heard with the aid of a stethoscope. It is a result of the closing or snapping back of the heart valves and the flow of blood through the heart and blood vessels. Sound is created by reverberation and the heart sounds area normal phenomenon. Sometimes, additional or abnormal sounds may be heard when the normal flow of blood is affected or heart valves are diseased. Heart murmurs are extra and abnormal heart sounds that may be an indication of a problem in the cardiac cycle. Murmurs sound like clicks, knocks, snaps or whooshing. The four normal heart sounds are a consequence of vibration of the flow of blood and closure of the heart valves. Similarly heart murmurs are a result of vibration caused by turbulent flow or abnormal closure of the heart valves. A murmur is not always an indication of a problem though and most are benign or innocent murmurs. Although there are four heart sounds, only two can be clearly heard with a third sometimes evident upon auscultation and the fourth requiring specialized equipment to be detected. The first heart sound arises when the ventricles contract (systole) and the valves between the atria and ventricles (mitral and tricuspid valves) close. The second heart sound occurs at the end of systole when the aortic and pulmonary valves close thereby preventing a backward flow (regurgitation) of blood into the ventricles. Abnormal heart murmurs may stem from two problems – cardiac shunts or heart valve disease. Cardiac shunts are seen in infants and children with congenital heart abnormalities like a septal defect (“hole in the heart wall”). Heart valve disease may also be present from birth. Therefore these are known as congenital murmurs. In adults, most heart murmurs are due to heart valve disease, develop during life and are therefore termed acquired heart murmurs. In order to understand how murmurs occur, it is important to have a knowledge of the normal cardiac cycle. The atria of the heart are constantly receiving blood from the veins (vena cava ~ right atrium; pulmonary veins ~ left atrium). Most of this blood (about 80%) flows into the ventricles even before the atria contract. However, atrial contraction ensures that the extra 20% of blood fills the ventricles fully. The ventricles then contract (systole). In order to prevent blood from flowing backwards into the atria, two AV (atrioventricular) valves exist. In the right atrium, this is the tricuspid valve while in the left ventricle, it is the bicuspid or mitral valve. These valves close when ventricular contraction pulls on the chorda tendinae attached to the valve leaflets as well as with the increased pressure within the ventricle. Blood is then forced out rapidly from the right and left ventricle into the pulmonary artery and aorta respectively. As the ventricular contraction reaches the end, the pressure of the ejected blood drops. 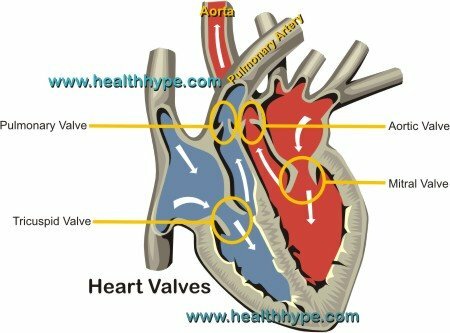 A little blood attempts to flow backwards but then fills the cusps of the pulmonary valve of the pulmonary artery and aortic valve of the aorta which causes it to close. The ventricles can then relax (diastole) and fill with blood from the atria. The heart valves therefore control the direction of blood flow through the heart and great blood vessels. Systolic murmurs occur during contraction of the heart muscle (systole). It may be a result of blood being forced through the partially closed aortic valve which should be fully open (aortic stenosis), or the partially opened mitral valve which should be fully closed (mitral regurgitation). Some systolic murmurs may be normal. Diastolic murmurs occur at the end of ventricular contraction (systole) and during relaxation when the ventricles should be filling with blood from the atria. It may arise when the partially opened aortic valve allows blood from the aorta to flow back into the ventricle (aortic regurgitation) or from the partially closed mitral valve which should be fully open (mitral stenosis). All diastolic murmurs are abnormal. The murmurs are therefore a result of a leaky valve or a narrowed or hardened valve. Leaky valves allow blood to flow backwards (regurgitation) and narrowed valves hamper the flow of blood in the correct direction (ejection). Read more on heart valve disease for further information. Mid-systolic murmur that is heard midway through systole. Mid-late systolic murmur is heard between mid to late stages of systole. Pansystolic murmur heard throughout systole. Early diastolic murmur heard at the start of diastole or towards the very end of systole. Mid-diastolic murmur heard midway through diastole. Continuous murmurs heard through systole and diastole. Most murmurs are benign and therefore harmless. While there may be some disturbance in the cardiac cycle, it is usually insignificant even in the long term. Abnormal heart murmurs arise with significant disturbance in the cardiac cycle. However, it often remains asymptomatic and patients may not experience any complication even in the long term. In order to understand the effects of murmurs, it is important to know the functions of the cardiac cycle. Deoxygenated blood reaches the heart through the vena cava and enters the right atrium. This is then passed on to the right ventricle which pushes it on to the lungs through the pulmonary artery for oxygenation. 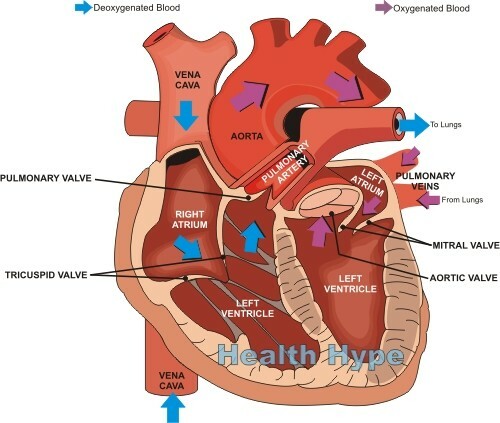 The newly oxygenated blood returns to the heart by the way of the pulmonary veins and enters the left atrium. It fills into the left ventricle and is then pushed out to the rest of the body through the aorta. Blood may back up in the heart and slow the return of deoxygenated blood from the rest of the body. It may also prevent oxygenated blood from being pushed out with sufficient force to reach all the tissues of the body. Therefore a murmur affects the return of deoxygenated blood, oxygenation of deoxygenated blood and distribution of the newly oxygenated blood. With septal defects, deoxygenated and oxygenated blood mix and this hampers the oxygen supply to tissue. Murmurs may arise with various diseases and abnormalities. Some are present from birth (congenital) while other develop during life (acquired). Risks include a family history of heart defects and pregnancy complications associated with drug/alcohol use, rubella (German measles) and uncontrolled diabetes.